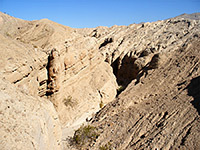 The two main features in the northeast section of Anza-Borrego Desert State Park are the Borrego Badlands and the Santa Rosa Mountains. The badlands occupy a sizeable part of the mostly flat land between S22 and CA 78, east of the enclosed, privately owned area around Borrego Springs, and present a dramatic spectacle with many square miles of angled strata and variegated mud hills, and absolutely no vegetation. They are visible from a distance along a short stretch of S22 as it climbs from the central basin but are soon hidden from view by an intermediate range of low hills. 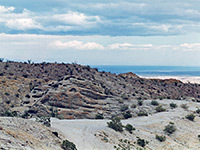 A few miles further east, various tracks head right into the heart of the badlands, suitable for 4WD vehicles or hiking, including the 4 mile road to Fonts Point at 1,300 feet and the 3.5 miles of the Thimble Trail to Mal Pais Vista. On the north side of the highway, the Santa Rosa Mountains rise steeply to over 5,500 feet but are generally inaccessible, explorable only by off-trail hiking. S22, also known as the Erosion Road because of the variety of weathered landscapes it traverses, climbs a little once east of the Borrego Badlands into the foothills of the Santa Rosa Mountains. The terrain becomes more undulating as the road passes many steep ravines, some of which become slot canyons upstream, such as the South and Middle Forks of Palm Wash, reached by the trail/track to Calcite Mine (at milepost 38). This is an interesting, moderately steep and rather uneven 2 mile route to an area used for calcite excavation during WW2, the crystals being required for the manufacture of sighting equipment. Nice specimens of this mineral can still be found in the trenches that were dug where the calcite seams are exposed; most are whitish but some are quite clear and transparent. The trail offers increasingly good views of canyons, the Borrego Badlands and distant desert towards the Salton Sea. Three small palm oases (Seventeen Palms, Five Palms and Una Palma) can be reached by hiking or driving 4.3 miles along a 4WD track branching southeastwards at the Arroyo Salado primitive camping area, near the east edge of the park. Just outside the park boundary, the highway passes another vista of colorful badlands and washes, which stretch northwards around the lower reaches of Palm Wash. Thereafter the land becomes more barren and sandy, the elevation drops to below sea level and CA 78 approaches the scattered, dusty town of Salton City. Dirt tracks leave both sides of the road leading to many sites popular for free primitive camping, on sandy plains and beside dry washes. To the south, CA 78 crosses flat land with scattered bushes and cacti. It exits the state park shortly before the small village of Ocotillo Wells although a side road branches south and re-crosses the park boundary, ending at Split Mountain from which various trails continue on into the southern backcountry. East of the village, the Ocotillo Wells State Vehicular Recreation Area comprises a large area of dunes and dry washes given over to ATV use. A ridge of hills named Borrego Mountain blocks views of the Borrego Badlands from CA 78 but they can be seen by hiking/driving along one of several sandy tracks that climb up towards the ridge. One such leaves the main road 1.5 miles east of the junction with Borrego Springs Road. After 2 miles it reaches a narrow canyon known as The Slot, starting point for a one mile path to the top of the nearby hills, where the mud mounds of the lowlands are replaced by granite boulders. 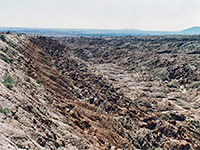 This has excellent views not only of the badlands but of the whole central basin and the enclosing mountains.